Chances are, if you are like most adults, you don’t remember the first party you attended as a child. And it is even more likely that the first party was a birthday party. In fact, it may even have been your own birthday celebration. Around the world, birthdays are celebrated as we mark the end of a year and the start of a new one. Relatives and friends gather to share food and drink, bringing gifts and enjoying a special birthday cake. Because these life events occur only once a year, there is a certain amount of pressure on the host to deliver a memorable event. But memorable does not have to be “perfect.” Instead of stressing over as you strive for perfection, focus on a birthday party that is personal for the guest of honor. Those unique touches will make the birthday party one to remember for years to come. Birthdays are personal, and birthday parties should be as well. If you don’t know your guest of honor, gather some information about him or her. What are their hobbies and interests? How do they spend their free time? Learning whether they enjoy playing golf, cooking, or traveling will present numerous opportunities for you to personalize their party with . For example, use a favorite hobby as a theme for the birthday cake and decorations. For the golfer, set up a putting green in a corner of the backyard or venue for guests to try their hand. Use green tablecloths with golf ball candle holders. If your guest of honor is a traveler, send out traditional tourist postcards in lieu of customized printed invitations and offer a varied international menu from some of the places they have visited. For a children’s party, finding hobbies can be challenging depending on the age. So, if the child is too young to be playing soccer or performing in dance recitals, pick an area of general interest and make that your theme. For example, if the birthday child is fond of pirates and adventure, hold a scavenger hunt. For younger children, keep it simple and have them work in teams of three and keep the list of items short. Older children will enjoy the challenge of finding numerous items on their own, relishing the competition for a prize. Children remember what they did at a party and whether they had fun playing games. Less important is whether the balloons matched the napkins and the overall color scheme. All successful birthday parties—and all successful parties in general—require advanced planning. When planning a birthday party, there are a few different elements to consider so let’s break it down into two types of birthday parties: children and adult. Limit the number of children: The rule of thumb is to match the number of guests with the age of the birthday child. For example, invite four children for a four-year-old’s birthday party. While that may not be reasonable in circumstances of a large family, in general, it is better to invite fewer children to a children’s birthday party. It doesn’t take long for a well-planned party to spiral out of control when too many children, excited for the party and fueled on sugary cake, take over. Games become hard to control and the birthday child is often overwhelmed. If you do need to invite a large number of children for whatever reason, then have additional help. Having extra bodies, whether that is paid staff or a few friends and relatives, in charge of keeping the children entertained can be a lifesaver. Keep it short: While an hour and a half may seem like a short period of time to celebrate a three-year-old’s birthday, that 90 minutes can seem like 900 minutes when cranky children in need of the afternoon nap begin their meltdowns. So keep the official party time to an hour and a half; many parents, when picking up their children, stay and socialize at the end of the party so the party will go for two hours anyway. Time it Right: can start at 5:00 in the afternoon. Not children’s birthday parties. If the guests are still of napping age, time the party in between the morning and afternoon naps. Starting sometime before noon and ending by 1:30 p.m. works well; guests will arrive rested and ready for . School-aged children can certainly stay up late, but that is not the best time for a party. Plan your celebration to end by 5:00. After a few hours of play, they are tired and hungry for dinner, the perfect time to send them home again. Many adults are really children at heart, and they look forward to and enjoy a celebration in their honor. It is a chance to enjoy the company of friends and family, receive gifts, and be the center of attention for a little while. That being said, some adults prefer small, intimate gatherings to celebrate; others can’t wait to shout from the rooftops and party at a large-scale daylong event. So the first step in planning an adult birthday party is to get to know your guest and . Big birthday milestones don’t necessarily need to be celebrated in a big way. For those who have a large family, an extensive social or business network, or those who enjoy mingling amongst a crowd of well-wishers, bigger may be better. For others who may have a close inner circle of friends, or perhaps a small, close-knit family, more intimate gatherings may be preferable. The key point here is to weigh in with your host regarding his or her thoughts on their celebration. , then talk to the guest of honor’s spouse or partner or closest friends to determine which approach is best. 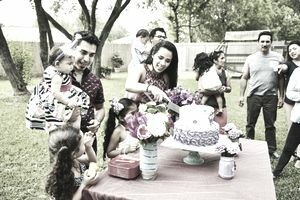 Surprise parties can be fun, but the surprise element should be a positive experience stemming from the timing of the celebration, not on the party itself. to making a birthday party memorable. Research back to the year they were born and incorporate newsworthy details from that time period into the party theme. Depending upon the year, invite guests to dress as they would have if it were that year. 1960s hippie clothes and 1980s big hair can make a party fun and provide great opportunities for photos, laughter, and reminiscing.